Pharmacovigilance is a critical element of drug development and marketing. The evaluation and monitoring of patient safety and a drug’s benefit/risk is a highly regulated global task, which is required continuously throughout a drug’s lifecycle. The results of such analyses are reported to health authorities in periodic aggregate reports, and further PV documentation such as the RMP are increasingly required in regulations worldwide. The pharmacovigilance (PV) medical writer plays a crucial role – not only in the production of these documents, but also in their management. A skilled PV medical writer provides PV expertise; extensive knowledge of formal requirements and guidelines; document, format, and content expertise; and writing, communication, and project management skills. These skills ensure that the presentation of patient safety, the drug’s benefit/risk profile and the company’s risk management assessments to regulatory authorities are clear and consistent across the whole suite of PV documents, and that these documents are produced in a timely and efficient manner. Throughout clinical development and the post marketing phase, drug developers and marketing authorisation holders (MAHs) invest heavily in monitoring and evaluating patient safety, and in managing the risks associated with drug exposure. The term “pharmacovigilance” encompasses the science and activities relating to the surveillance, detection, assessment, understanding, and prevention of adverse effects or any other drug related problem. Surveillance of safety data is a permanent activity, designed to ensure that potential safety signals are detected early and that the risks of exposing a patient to adverse drug effects are minimised. Safety data are then analysed and the results provided to regulatory authorities (RAs) in periodic aggregate reports, most notably the Development Safety Update Report (DSUR) and the Periodic Benefit Risk Evaluation Report (PBRER or PSUR). 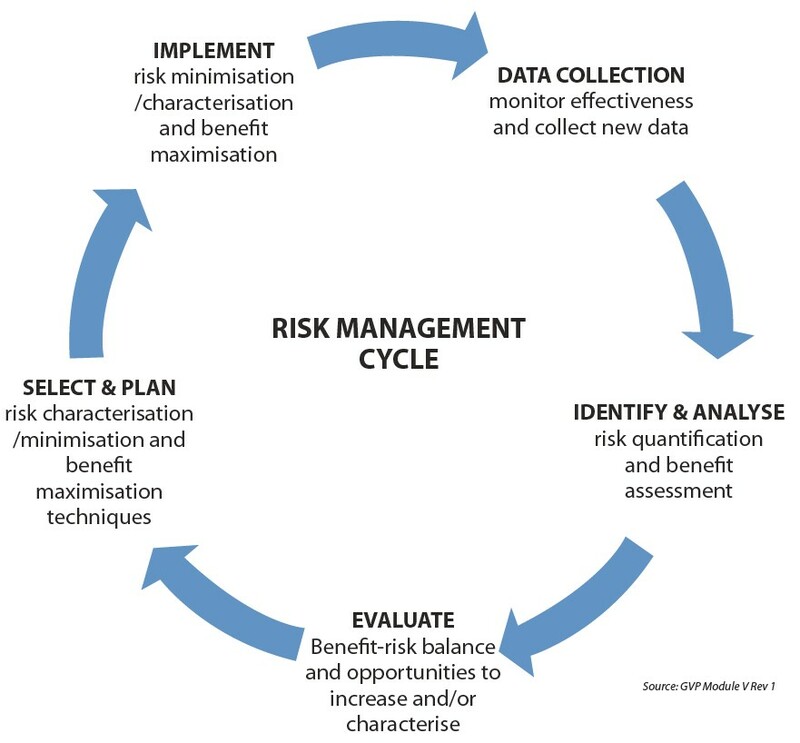 The MAH has a legal obligation to assess and manage the risks associated with their drug, and their risk management system and its associated risk minimisation activities are documented in the Risk Management Plan (RMP). Each of these documents is required at a different stage of a drug’s lifecycle and fulfils different roles (see Figure 1). Traditionally, PV documents have been authored by experts from the main contributing disciplines, eg PV, regulatory affairs, and medical affairs. However, implementation of the EU Guideline on Good Pharmacovigilance Practices (GVP) in 2012 introduced extensive changes, particularly to the format and scope of the PBRER and RMP, and to the way PV documents are assessed. To meet the challenge of these changes, the PV medical writer works in collaboration with the traditional team of authors. The medical writer’s role is crucial to ensure that the presentation of patient safety, the drug’s benefit/risk profile, and the MAH’s risk management assessment are clear to RAs, are consistent across the whole suite of PV documents, and that PV documents are produced in accordance with their strict deadlines. The requirement to submit PV documents to RAs starts with the first authorisation to conduct a clinical trial in any country worldwide. This date is defined as the development international birth date (DIBD) and marks the beginning of the reporting period of the first DSUR. 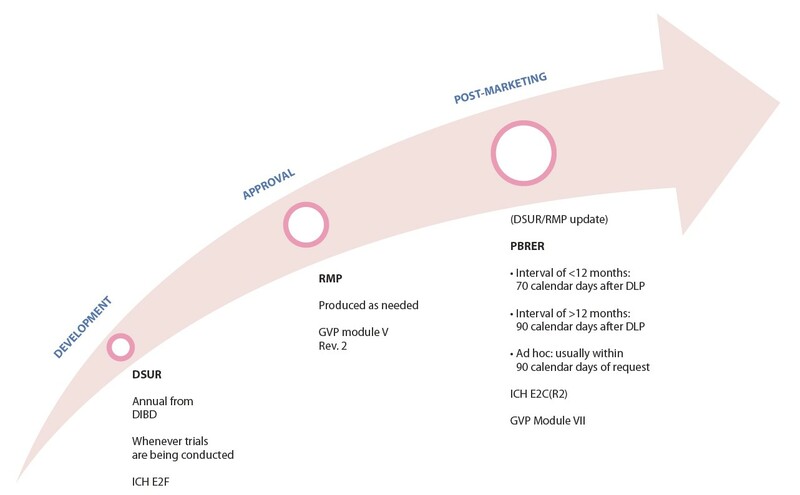 The first data lock point (DLP) is 12 months thereafter and, as defined in ICH E2F along with their content and format, annual DSURs must then be submitted for as long as patients are exposed to the drug in interventional clinical trials. The DSUR must be submitted to RAs within 60 days after DLP. The aim of the DSUR is to provide a periodic analysis of the safety of an investigational drug in clinical trials, to ensure patient safety during clinical development. There are several other requirements for reporting individual adverse events during trials, and so the DSUR is not the primary tool for reporting new important safety information to RAs. Instead, it summarises all relevant safety information that was collected during the reporting period. As for all PV documents, time can be a critical issue, and this is especially the case when working on DSURs for drugs well advanced in clinical development. The PV medical writer guides the team through the specific requirements of the DSUR and ensures that the document is concise and focuses on new and relevant safety information. DSURs are produced during clinical development, and so the most critical point is the introduction of “important identified and important potential risks”. These are well defined subsets of the risks known to be, or are potentially, associated with the investigational drug, as described in the Investigator’s Brochure. An important risk is any risk that could have an impact on the benefit/risk profile of the drug or have implications for public health. Once defined in the DSUR, important identified and potential risks are carried forward beyond marketing approval and significantly drive the content of other PV documents (eg the RMP and the PBRER), and may require specific PV activities to prevent or minimise them. They must therefore be selected carefully and the PV medical writer’s role and experience is crucial to guide the team and alert them to the implications for future documents. In the EU and an increasing number of non EU countries, an RMP is required for any new marketing application. The content and format of the RMP is defined in GVP Module V. The document is well regulated in the EU and is well established globally. It is provided to RAs in Module 1 of the Common Technical Document (CTD) submission dossier and is one of the last documents to be completed before the Marketing Authorisation Application is submitted because it can only be finalised when the Summary of Product Characteristics is final. The aim of the RMP is to describe the safety profile of the drug, ie the important identified and important potential risks, plus any missing information (which is usually composed of potential risks for sub populations that were not sufficiently investigated in clinical trials). In addition, the RMP must describe measures to prevent or minimise these risks and methods to assess the effectiveness of the interventions. It describes any post authorization obligations and evaluates whether the efficacy shown in clinical studies is also seen in everyday medical practice, and whether there is a need for post authorisation efficacy trials. To write the RMP, the PV medical writer must have a sound knowledge of the relevant guidelines and ensure that all contributions from other authors comply with GVP requirements. In addition, they must ensure that information contained in other submission documents (eg CTD clinical summaries) is in line with the data presented in the RMP. The PV medical writer also uses his/her expertise and knowledge of the guidance and requirements to plan the most appropriate document format and the level of detail for data presentation, leading discussions on the risks and their categorisation as safety concerns, and on the strategic planning of related submission documents. Risk management is a permanent activity that is ongoing for as long as patients are exposed to a drug. In this sense, the RMP is an exceptional document because it can be revised at any time in the drug’s lifecycle. Starting with version 1 (submitted with the initial marketing application), the RMP is assessed by RAs and might then be updated and revised multiple times until the drug is approved. In the post-marketing phase, the RMP is frequently updated whenever new safety information becomes available and in response to specific PV activities (see Figure 2). RMP management is also an ongoing activity, involving updating the RMP and implementing or responding to comments from regulatory assessors. Depending on the level of project activity (eg submissions for new indications, line extensions), multiple versions of the RMP can be under assessment simultaneously by various global RAs. PV medical writers have a central role in maintaining oversight of the RMPs created for parallel submissions, managing complicated version control. The content of the RMPs can also vary between different regions according to local requirements. These are often complex issues, and good team interaction and internal processes are crucial. In the ICH regions, creating post marketing PSURs is a prerequisite of marketing approval. This can be the PBRER in the EU (GVP module VII) and most Eastern European countries, the Periodic Adverse Drug Experience Report (PADER) in the US, or the Annual Safety Report (ASR) in Canada. The PBRER is accepted by most countries, even those that provide specific local report templates, and its content and format are specified in ICH E2C (R2). The reporting requirement and period of the PBRER starts with the International Birthdate ie, the marketing approval date. In the EU, the reporting frequency for each drug is published online in the EU reference date list. After marketing approval, this frequency varies by region and drug lifecycle point (see Table 1). The aim of the PBRER is to present a comprehensive and critical analysis of the benefit/risk profile of the drug, taking into account new or emerging information, in the context of cumulative information. This is to assure RAs that the evolving risk profile of the drug is adequately monitored. The PBRER focuses on summarising important relevant safety information from the reporting period, putting it into context with the cumulative experience. It is neither a tool to provide relevant information for the first time nor a “data dump” of extensive data from individual case reports. In the EU, PBRERs covering up to 12 months of data are due 70 days after the DLP and reports covering more than 12 months are due 90 days after the DLP. The PBRER is assessed by the RA and feedback is provided to the MAH in the form of assessment reports. In these reports, an authority may request more detail on existing issues, or for new safety topics to be addressed in the next PBRER. PV medical writers have to guide teams through the relevant topics, advise on the level of detail, and manage the report timeline. Especially when writing for drugs on a six month periodicity, good time and project management skills are essential, considering that the assessment report for the last PBRER can be expected when the team is already writing the next report. The DSUR, PBRER, and RMP are designed to be modular documents, meaning that sections should be common to all three documents. Therefore, PV medical writers also have to ensure that the content of the PBRER is consistent with the information provided in the parallel DSUR and the potential RMP update. Management of global PBRER periodicities and frequencies poses an enormous challenge to MAHs worldwide. DLPs and periodicities cannot be harmonised globally, eg China and Brazil accept the PBRER, but have their own DLPs, the Eurasian regions have different periodicities to the EU, and the US and Canada require annual reports. The PBRER can be a very large document, and requires input from many different stakeholders. An experienced and skilled PV medical writer can work with a dedicated medical writing group to establish a global report strategy for each drug so that as few PBRERs are written as absolutely necessary, while complying with global regulatory requirements. Although the PBRER, DSUR and RMP are ICH formats and are widely accepted for submission to most health authorities, local formats like the PADER and the Investigational New Drug Annual Report in the US, or the ASR in Canada are often still submitted in lieu of these reports. Particularly when the PBRER EU periodicity is over one year, some MAHs prefer to write PADERs as annual reports and then submit the PBRER, eg every three years. Since the introduction of GVP, PV has become more complex and further regulated. This has led to an increasing demand for medical writers who are familiar with PV documents and have the skill set necessary to deal with multi-disciplinary teams, complicated data, and challenging deadlines. It is of utmost importance that the presentation of patient safety, the drug’s benefit/risk profile, and the MAH’s risk management assessments to RAs is compliant with requirements, clear and consistent across the whole suite of PV documents, and that these documents are produced in a timely and efficient manner. Involving an experienced PV medical writer in a product team ensures this, and enables the PV and medical experts to focus on their core task – patient safety.